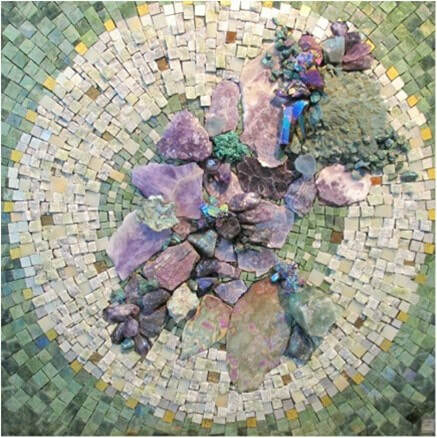 Carol Talkov says, “My professional life has always been about putting pieces together.” Working with Mosaics she now puts pieces of minerals and gems together to create works of art. My early training was as a pattern maker for theatrical costumes. My undergraduate degree was in theatrical design and I my graduate work was specifically in costume design and fabrication. I was always more interested in how things were put together and when I finished with my academic training I went to New York City not as a designer but as a fabricator. I was very fortunate to arrive at a time when there still were a few pattern makers in the costume industry in New York who were European trained and learned my trade from them as “draper” of women’s costumes. A draper is one who makes a pattern on a dress form as opposed to a tailor who makes a pattern on the “flat”. For 10 years I had the opportunity to work from many designers’ drawings making patterns and supervising the fit and fabrication of the costumes for Broadway theatrical productions along with opera, dance and film. When I left New York I was given a dress form (model) that many years ago been made specifically for Elizabeth Taylor when she was a younger woman. This was not an uncommon thing since most “stars” of her caliber had their own figure reproduced for a draper to work on. Many years later when I was just starting working with mosaics I wanted to do a sculpture in my garden.I honed up my patterning making skills and draped the dress form using metal mesh.I then removed the metal mesh and “sewed” up the pieces to create the same shape as the dress form.I then mortared it and applied broken ceramic pieces to it.The sculpture represented the costume ofa circus performer and I called it “The Snake Charmer”.It lived in my garden for 10 years. ​This past year I started seeing some damage on the piece and decided to remove the “tesserae” (pieces)from the sculpture and rework the design.I was planning on doing something that would reflect more of my current artistic sensibilities, more abstract. As I was removing the tesserae I was very excited about how it looked with just the imprint of the pieces and decided to paint it instead.After 3 different layers of different colours of paint I was satisfied with the final results.Unfortunately now that it is painted with interior grade paint it cannot be placed in the garden anymore.“Elizabeth” in now a constant companion in my studio. You have had 2 previous careers, one in the professional theatre and one in the interior design industry. How have your previous careers transferred over to your current creative endeavour? 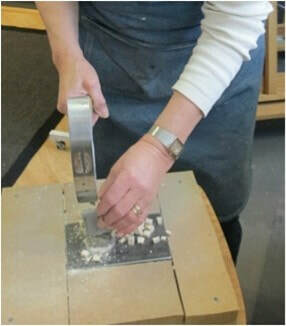 ling pieces to create a product. To be attracted to mosaics is a logical selection for me to express my own personal voice.I find that there is a great similarity between all 3 disciplines.I use the familiar principals ofrelationships between textures, colours, and line to create tension or harmony depending on what I want to piece to be about.I also have an instinctual sense ofscale and composition.I think that skill has been achieve after spending so many years deciphering and analysing many different designer’s renderings. You have travelled to Italy to participate in workshops over the past 10 years. What attracts you to Italy and why study there? I have been fortunate enough to go to Italy and be exposed to not only the influences ofRoman and Byzantine mosaics but also contemporary mosaics. The typical first exposure to the art ofmosaicin America is either in the context ofthe architectural, religious buildings or publicart or interior decoration done in back splashes and bathrooms.In Italy there is a cultural tradition that goes back thousands ofyears as an early form ofdecoration and expression.It is everywhere.You become immersed in the culture.The tesserae (pieces) materials used are the traditional ones, stone or glass smalti.Smalti is a type of glass specifically made for mosaics and is what the Byzantines used.Both of those materials are cut with a hammer (martellina)and hardie.The hardie is a blade coming upward out ofa piece ofwood and the steel hammer has sharp edges at each end.The weight ofthe hammer is important because you are not cutting the material, you are fracturing the material.This method ofcutting has been done for more than 2000 years.I felt Italy had the best offerings for learning this technique.Though now in the US it is more widely taught. 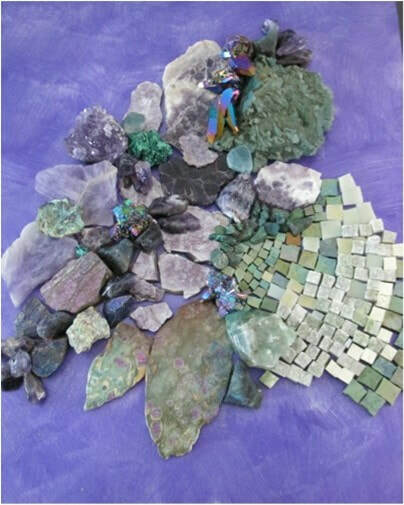 Why did you decide to incorporate minerals and gems into your mosaics? When I started to learn about working with stone as a material for creating mosaics I found myselfresponding to the natural richness ofthose materials.I was in a constant state ofwonder every time I cracked open a piece ofstone.It is the unique quality ofeach piece that intrigues me.When I started working solely in stone I wanted more variation in colour and reflection then what the traditional materials ofglass and stone offered so I started looking for another natural elements to incorporate.I wanted to continue to work with organic materials so that led me to minerals and gems. Where and how do you source the materials you work with? It is much easier today than when I first started doing mosaics 12 years ago.The Internet, EBay specifically, allows me to travel all over the world to amass different minerals and gems.I also go to mineral and gems shows and stores. I find discontinued and damaged pieces of marble, granite, travertine and other stone samples from distributors and fabricators offlooring and counter tops.I am an avid collector ofstones especially when I go traveling.On this most recent trip to Italy when I was attending a workshop we had the opportunity to go to the Taglimento River and collect stones.This riverbed is known for the rocks that are brought down from the Alps on their way to the Adriatic Sea. 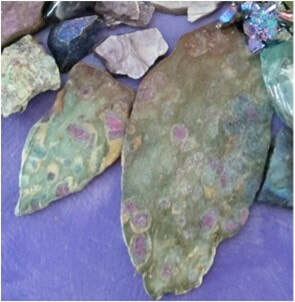 You use your artistic eye to create pattern(s) using minerals and gems. Is it often one stone or a group of stones that inspires you? Would you take one stone that has inspired a whole work and discuss it? Most of my work is about “relationships”, how one piece relates to the next piece creating the whole.Sometimes it is just one piece that intrigues me but ultimately it is a group of pieces that speaks to me. I start off forming a “nucleus” selecting “anchor” pieces that lead me in a direction. In the examples shown below it is the pieces of ruby fuchsite, the titanium points and the large actinolite crystal mass. ​As I start to collect other materials that relate to those pieces I start to form the composition. By now I have added 5 different types of amethyst along with lepidolite, fluorite, malachite and other minerals and gemstones.This is when I start experimenting with the contrast of colour, texture, and balancing those elements.After I am satisfied with the focus of the piece I determine the “andamento”, how the tesserae is placed, creating the flow and movement ofthe piece.It is the relationship of the pieces that form the narrative of the artwork.I rarely have a narrative in mind when I begin a piece because the process of creating the work, the journey, is what I am experiencing. As the work progresses I started to feel the energy radiating away from the nucleus, an explosion propelling outward.Therefore I chose an andamento pattern that visually reinforced that movement.Each of the elements in this piece has singular sources of energy, but when grouped together it becomes very powerful.I wanted to convey the force of that power. You work in both 2D and 3D. Can you expand on one of each? I like to explore all options available to me; I work with materials that can be used in either of these forms I don’t feel I have to declare one or the other as my vehicle of expression. Because of the nature of the materials I can make a 2 dimensional piece with many of the same characteristics as a sculptured, 3 dimensional piece. When working on “Wired” I wanted to have a great deal of movement by emphasizing the wavy and amento of the black tourmaline by undulating the substrate, supporting the radiating and amento from the centre of the pyrite and optical calcite circle using the Bianco Carrara marble tesserae. As opposed to applying the tesserae to a sculpted form. Size and weight are always a part of the equation.The traditional materials that I use are heavy and are applied using thinned cement.The 3 dimensional pieces have substructures of polystyrene. Mosaics are frequently done in public spaces and can be quiet large.I choose to do smaller scale pieces because I feel my work is intimate and needs to be experienced close up.I use a percentage of repurposed materials, which allows me to use more expensive minerals and gems and still keep the cost down. Presently my preferred size to work in is between 8” – 12” square or 7” x 28” rectangular.I like both the formats because they lend themselves to groupings.I have been working on a group of small pieces that relate to fabrics.Below are images of2 series.One titled “Silk” and another titled “Tweed”.All are 8” x 8” and approximately 3 lbs.each. For both of these series I have focused on colour and texture.The feeling of woven fabricalong with soft colour fades. Mosaic Art is one of the oldest Art forms but relatively ‘new’ in the current contemporary art market. Discuss how the promotion of your art is happening in galleries today? 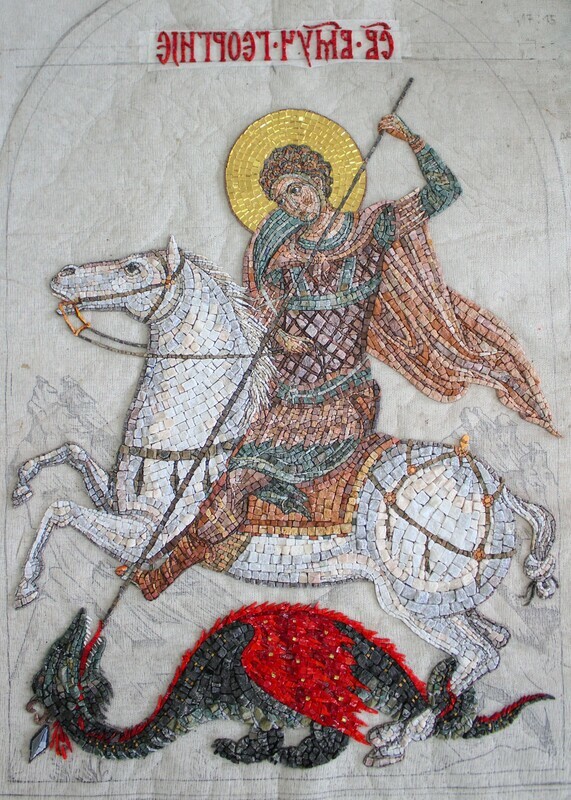 Where can someone go see great mosaics today? Mosaic art today is slowly finding its way into the contemporary art dialogue. 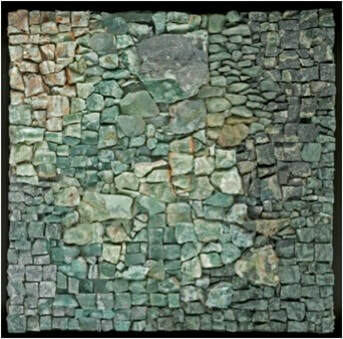 People still associate the word “mosaic” with either architecture or as a technique of decorating items such as frames or mirrors.Therefore mosaics today are commonly categorized as “mixed media”.It will take re-educating the art viewing public to accept the term “mosaic” in the context of fine art unencumbered by its history.Having mosaic artists included in electronic magazines such as Zoneone Arts helps people to acquire a different point of reference.There are exhibitions focusing on mosaic art all over the world and you can look for them on line.In Italy contemporary mosaics are very visible in towns such as Ravenna and Spilimbergo where there are many educational institutions devoted to contemporary mosaics.